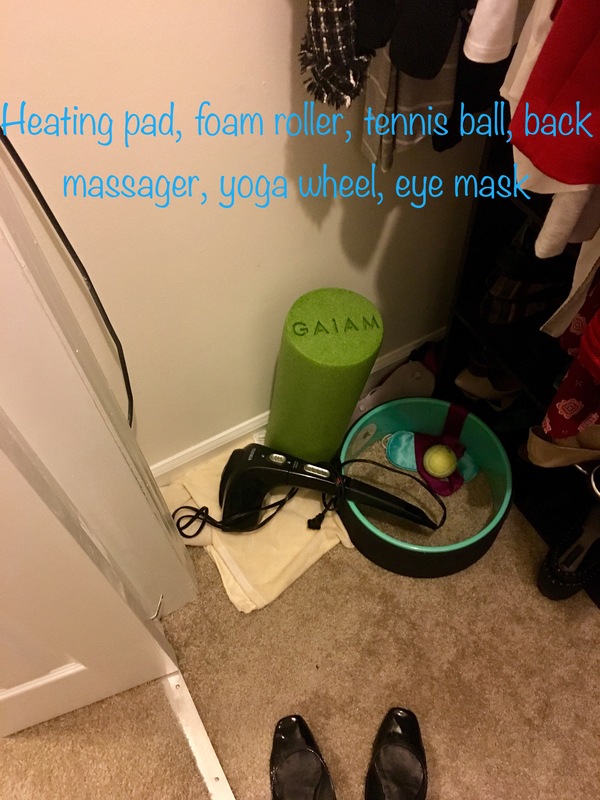 Humidifier yup, biofreeze yup, foam roller yes although sometimes it is in the den so I am guilted into using it instead of just sitting, lotions yup, open drawers you bet ( they’re hard to open), water and tennis ball yep, a well lived in room….always. Water bottle, morning meds, foam roller, pillow stack, fuzzy socks, mini tens (the battery size so I can fall asleep with it on and not strangle myself with cords), a little ball roller massage gadget, oil instead of lotion, and I’m desperate to change my drawer handles because opening and closing is too much on some days (but all three of mine are stuffed). How’s your by the couch set up? Blankets, cushions, water bottle, another ball roller massage gadget, a powered tens machine, my nightly meds (in a toiletries bag) and a circulation booster which I slide back under the chair when I’m done to pretend I’m not decorating RA style everywhere. Haha! My couch setup is pretty basic- I do have some firm pillows that I use to make sure I have enough back support as well as a couch desk contraption to put my laptop on. I have a selection of heating pads, some live upstairs and some downstairs, that I carry around with me. Another tennis ball. 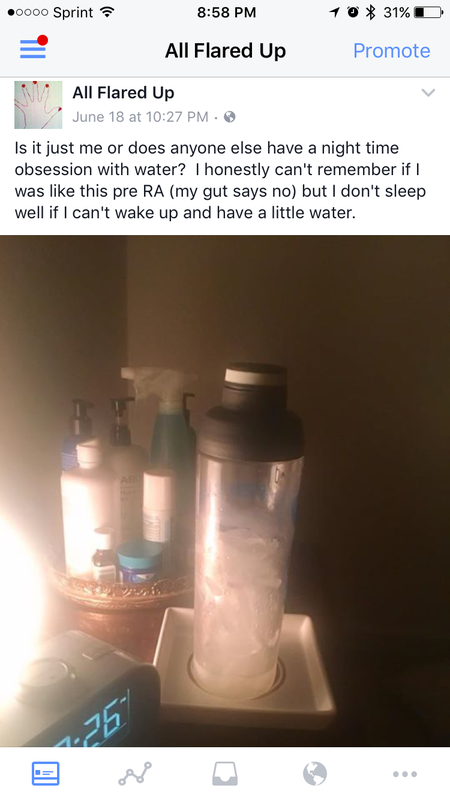 I’m the same with water, and no, i wasn’t before RA – I think I did like to have water by my bedside before but I rarely drank it. Now I drink most of it every night. 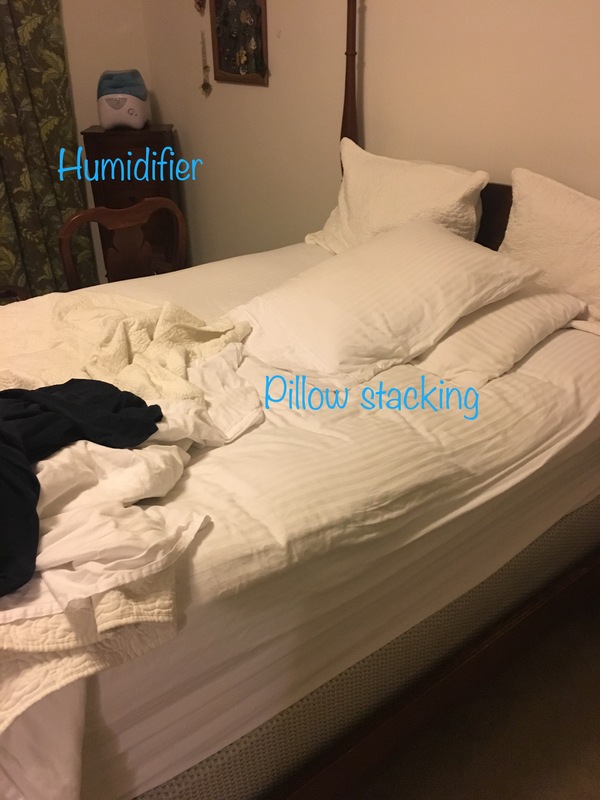 I would LOVE to be able to not move much when I sleep, but I move a LOT and no pillow formation is going to stop me. However, I’m VERY fussy about my pillows – they have to be in just the right place and of course the right pillows. And funnily enough, and I really don’t think we can blame RA for this, I have a top drawer crammed with tons of stuff, mostly medications of one kind or another, and two draws below which, although they do have stuff in, are full of things that I NEVER use. Can’t remember the last time I opened those drawers! I’m glad I’m not the only one who has drawer clutter! Perhaps that will go on my chore list? Let’s check back in, I dunno, say 12 months, and see if either of us has de cluttered! I suspect chances are slim to nonexistent! My nightstand is very similar. Water.. Lots of water. I used to hate it but after my RA diagnosis and all the meds I am thirsty all the time. I actually just started on Philocarpine which is helping my dry mouth, eyes and nose. Actually just added Sjogrens to my list of issues. I can actually have a conversation without sipping water every few sentences. 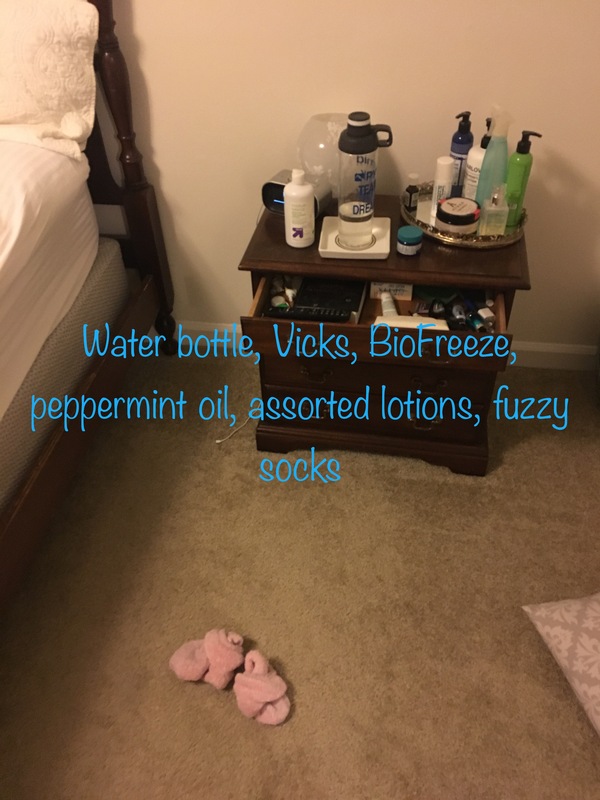 Heating pad, massager, lotion, and socks are always close by. Just recently started wearing a mouth guard at night. I seem to tense up and “hold myself” alot due to pain,and I find myself clenching my teeth. Now at least during the night there is some cushion and now I dont wake up with my jaw and neck so tight and stiff. I was diagnosed with RA in 2011. This is my first time to start reading blogs. Life is extremely hard and I have been scouring the internet to find others who have been through what I am in the middle of. So happy to find that there are others out there who are sharing their stuggles and victories. Thank You all! Vicks is fantastic and not as excruciating as some other products when coming in contact with mucus membranes. Ben-Gay is a wonderful tool of the devil that I used religiously in sports, but now I rely on Vicks as I can use that on knees, feet, elbows, hands and nose all at once while not asphyxiating. Ok, so the eyes do water but they don’t burn like I’m in the seventh level of hell as they would with Ben-Gay. Biofreeze is fantastic but too slippery for my fine motor skills. Vicks is thick and slow, which is perfect for me. Water is a must, especially when I’m in the two-day crossing of the Methotrexate desert. I’m on day two of this week’s trek and parched as usual though out of the fog enough to (hopefully) write coherently and on topic. Thanks for the insights and recommendations. So here I am, sipping my coffee reading through your blog and I realized I’m all caught up! I really enjoy your writing…thank you so much for giving insight into what RA looks like for 20/30 somethings that have full time jobs and active lives. It’s been a pleasure reading, keep up the good work! I just found your blog today and I am the SAME WAY about the light. Omg. There are like 3 lights outside my window and even with blackout curtains, the gap from the curtain not being right up against the wall screws it up. Plus any tiny little light in my room, like my husband’s phone charger if it’s facing my direction. Oh hell no!